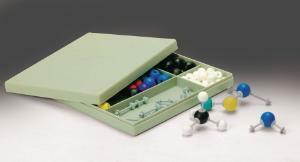 Useful for individual or group study of molecules, these model sets offer an interactive learning opportunity. These model sets offer an interactive learning opportunity. Students construct molecules from color-coded plastic atoms and learn about the structure and function of each. The holes in each atom are set at angles that accept the included, flexible connectors of various lengths that represent the different bonds. Medium, gray links represent single covalent bonds, long and gray links represent double and triple covalent bonds, and short and white links can be used to construct compact models. With this comprehensive large set, students learn about alkanes, alcohols, aldehydes, ketones, and other organic structures. This set is ideal for introductory lessons in atoms and molecular structure. Ordering information: This kit includes 16- 15mm 1 hole white hydrogen atoms, 8- 22mm 4 hole black carbon atoms, 2- 22mm 4 hole blue nitrogen atoms, 6- 20mm 2 hole red oxygen atoms, 2- 20mm 1 hole green halogen (Cl) atoms, 2- 15mm 1 hole pale green halogen (F) atoms, 22 medium grey links and 6 long flexible grey links.